We have some of the top commercial plumbers in Hamilton who know that any business needs proper maintenance and plumbing repairs from time to time in order to run smoothly and efficiently. That’s why we work with numerous local commercial businesses to meet all of their plumbing needs when they occur. We cater to restaurants, industrial complexes, office buildings, public facilities, and many others. With our experience in commercial plumbing we can solve any plumbing issue, and can regularly help you maintain your space to prevent future plumbing problems down the road such as a backwater valve replacement. We are the perfect solution for restaurant kitchens when it comes to clearing clogged drains that become blocked by sludge, sewage, food, and more. We can also go through and use our pressurized systems to wash out and clear any blockage for more efficiency and regular tune-ups. Overtime, restaurant piping can become clogged due to many factors. Allowing Hamilton Plumbing to periodically flush out your systems is a great preventative measure. For industrial complexes, we can help by repairing or installing specialized drains, piping, venting, and more. Many times industrial buildings have clogged drains due to the fact that multiple types of foreign objects tend to get washed down the drains. Commercial buildings and factories need regular system cleaning to ensure a smooth progression and flow. We can fix any bathroom facility to get you and your business up and running again. If you’re looking for reliable plumbing companies Hamilton has a few but none compare to our professional team. If you want the best commercial plumbing assistance, then give us a call today. We’ve worked on many commercial and new construction projects in Hamilton Ontario to properly pipe, vent, and adhere to the proper plumbing codes. We install plumbing in factories, and assist with the planning stage. 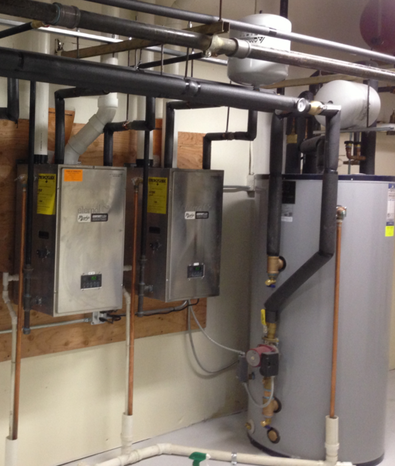 With our expertise, we ensure everything goes right the first time and is properly installed. Commercial plumbing, materials, and equipment are different from residential plumbing, and you need a trustworthy plumber who understands both. Because we have highly trained and skilled experts, your commercial project will be completed in a timely and professional manner. Our commercial services include properly installing or repairing commercial piping, venting pipes to target areas, repairing leaking pipes, toilets, and sinks, unclogging drains and toilets, flushing out sludge from existing systems, a sewer backwater valve installation, repairing septic tanks and faulty lines, and redirecting pipes for proper drainage. Whatever your commercial needs are, we can accommodate them. We are here to assist you, no matter how big or small the project may be. We give free estimates, so there’s nothing to lose by calling us today! Unlike other plumbing services in Hamilton, we promise to leave our customers satisfied. If you’re looking for a plumbing service that can help you with preventative measures and fix any issue you may have, then get in touch with Hamilton Plumbing today. Hamilton Plumbing knows that all commercial businesses need proper maintenance and repairs from time to time in order to run smoothly and efficiently. That’s why we work with numerous local commercial and industrial businesses to meet all their plumbing needs when they arise. With many years of experience our staff can solve any plumbing issue, and can assist your business with maintaining your plumbing system and preventing future plumbing problems down the road. Give us a call today via the number below or take a second to fill out the above form if you’re in need of commercial plumbing services. Our expert plumbers and staff are happy to assist you in whatever way they can!